Scotch 810 Magic Tape™ is a permanent invisible mending tape that has a matte finish which is almost invisible on paper. Manufactured from acetate with an acrylic adhesive, Magic Tape is ideal for repairing torn or loose pages and is high stable, long lasting and non yellowing with age. 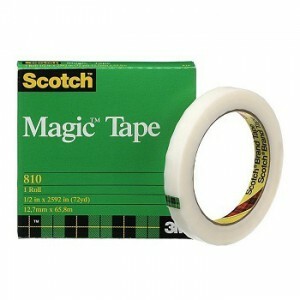 • Genuine Scotch brand high-quality 3M Magic tape. • The tape unwinds smoothly, tears off easily and has a unique adhesive and backing film. • Will not shadow on photocopiers or faxes, ideal for amending documents before sending. • If you happen to be filing the tape away, it is good to know its acid free so it will not yellow over time. • Also great for Book Repair, fixing rips in papers, scrapbooking and affixing notes to documents. • You can write onto Magic Tape with a pen, pencil or marker.